Hello creatives! It’s a brand new month so it’s time to give you another feature about an artist that has an amazing talent and distinct style in the world of digital illustration. This month we give you the amazing works of illustrator JP Valderrama all the way from New Jersey, USA. 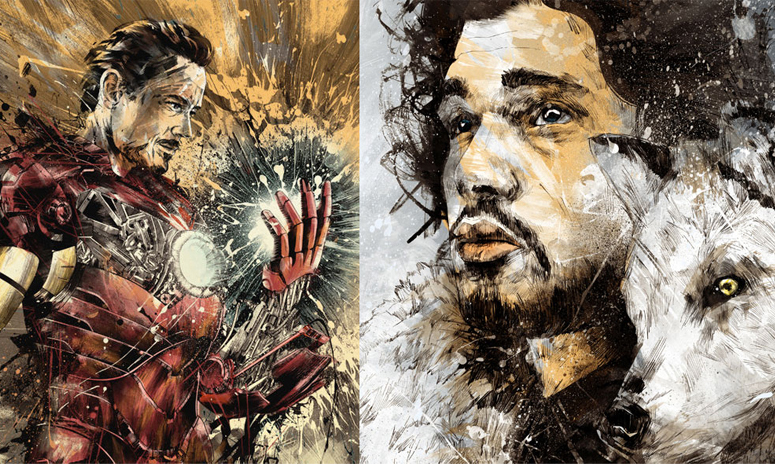 JP, popularly known as “The Fresh Doodle” on most of his online portfolios has this very distinct style in drawing semi-realistic portraits combined with great textures and massive blending of “splatter” techniques creating motion and dynamism within each image. Inspired by the works of another amazing artist – Russ Mills of Byroglyphics, JP has developed his own unique and creative style of rendering digital portraits. A computer, Wacom Intous tablet, Photoshop and a little dose of metal music are his ultimate tools of the trade. His career started when the first ever artwork of Fresh Doodle called “Abigail” got positive reviews and good feedback from his friends over Facebook. Since then, he decided to continue developing the unique style in making digital portraits until he finally received recognition from artists over numerous online art communities, doing commissioned projects, selling his works and joining different exhibitions. JP with his artwork entry called “7 of Pentacles” in his latest group exhibit “Tarot Mystics and the Occult” at Light Grey Art Lab. Don’t forget to check out The Fresh Doodle’s Facebook page for more updates about JP Valderrama’s “absolutely doodle-licious” works. Get to know him more in a fun interview as the latest featured artist at UCreative Spotlight. Feel free to tell us your thoughts about our latest featured artist by commenting below and might as well suggest some artists you know and wanted us to feature them in the future. Find You The Designer on Facebook, Twitter and Google Plus for more updates. Also, don’t forget to subscribe to our blog for everyday design news, freebies and awesomeness.